I did this interview with Nick back in early 2009. A very classy guy and a pleasure to talk to. It was a thrill to finally meet him in Las Vegas at the CAC Reunion (April 2009). 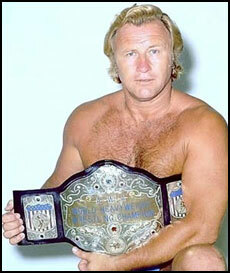 Nick Bockwinkel was the AWA world heavyweight champion from the mid 1970s thru the mid 1980s. Before that, along with Ray Stevens, they held the AWA world tag team titles. In 1978, Memphis promoter Jerry Jarrett moved his promotion away from the NWA banner to the AWA governing body. Over the next decade, Nick ended up defending his AWA world title in Memphis more than any other world champion ever did. In those 7 years, Nick's main opponent in Memphis was Jerry Lawler and their battles were legendary. Nick was a second generation wrestler and went on be one of the most well known wrestlers of the 1970s and 1980s. In 2007 Nick was inducted into the WWE Hall of Fame. Also that year, Nick was appointed President of the Cauliflower Alley Club. The "CAC" is an association that brings together the wrestlers of the past, the fans and the wrestling historians. It's a wonderful organization that honors the wrestlers of the past and remembers both their contributions and sacrifices to the sport we all loved. Mark: Nick, thanks for talking with me today, I can’t tell you how much I appreciate you taking time out of your day for this interview. Nick: It’s my pleasure Mark. Memphis was one of those towns I really enjoyed coming down to. Mark: I know as a fan, I really enjoyed watching your matches here. In the summer of 1978, Memphis promoter Jerry Jarrett started working under the banner of the AWA. Previously Memphis had always been an NWA town. That summer you had your first of many matches in Memphis and defended your AWA world title against Jerry Lawler. My initial question is, was Verne involved with this relationship with Memphis, or was it your dealings on your own time, or a mixture of both? Nick: It was all from an invite from Jerry Jarrett. I knock on wood because Memphis had been a predominantly NWA territory and for me it was a nice honor to be asked to come in. I went down to Texas quite a bit and before that Georgia and Florida when Ray Stevens and I were AWA world tag team champions. As I said, it was an honor for me because the South was made up of almost exclusively of NWA territories. For whatever reason, and I’m not sure if those NWA promoters were having issues getting Harley (Race) or others in as regularly as they wanted, but with my AWA schedule, I was available at the time Memphis and those other promotions needed me. It was nice for me to be able to go into NWA country as much as I did and I always took pride in that. Mark: Knowing this interview was coming up, I recently asked Jerry Jarrett about you and he immediately compared your classiness in the ring and in the dressing room, to that of the late legendary Lou Thesz. Your thoughts? That wasn’t exclusive to the wrestling business and was how most fathers felt in general. You could be a jerk at times in the dressing room and very professional in the ring. At the same time, a jerk is a jerk; a jack-off is jack-off and who wants to put up with them anyway. When I get complimented like that, I know my dad is looking down from the big arena ring in the sky with a smile on his face. Mark: Jarrett also mentioned the matches you and Jerry Lawler had. While you defended the World title against Bill Dundee, Jimmy Valiant, Austin Idol, etc, your most memorable matches in Memphis were against “the King”. Were the great matches with Jerry Lawler just because he was on top of the territory or was it because of the chemistry you two had? Nick: Jerry Lawler was an absolute first class professional in the ring. When you get two people in the ring whose mentality is to have a great match, to give the people an excellent performance and that basically have the same mentality on it; those are the type of matches you get and those are the type of matches we had. It wouldn’t have made a difference if our styles were opposites but I don’t feel my style was that much different than Jerry’s. We just clicked. The great thing about Jerry Lawler is that he made it very comfortable for whoever he was working with. When two guys get in there and have a great match, it’s kind of like they are paying each other a compliment, done physically rather than in words. It’s an unsaid thing and it’s not even known until after they’ve gotten into the ring with each other for the first time. Taking care of one another, being very professional and making sure the fans get a great match; that's what it's all about. Mark: A couple of angles the Memphis fans remember are the one where you told Lawler that you were tired of him always challenging you so you challenged him for the southern title. You won the belt for about a month before Lawler won the belt back. This set up a World title match between you and the King on Dec 27, 1982. The match ended with Lawler pinning you and walking out of the ring with the AWA World title. The decision was reversed 2 weeks later because your foot was on the ropes when the 3 count was given. I'm just wondering if you remember much about those angles? Nick: Haha, well that was a lot of years ago. To be honest, I didn't remember winning the Southern title. The other match, where Lawler seemingly won the title was a pretty common finish back then. In Memphis the angle worked very well. Mark: When I mention your trips to Memphis, what comes to mind? Nick: It’s more of an overview, but the one thing that really comes to mind is how much I enjoyed coming and anticipated coming to Memphis. Back in the AWA, Monday nights were usually pretty dead for us. When you were able to fill a building on a Monday night, you had something special going on. It's a lot more fun to work in front of a packed house than an empty one. Also, it was a straight shot there and back for me. I could fly in, wrestle and then jump back on the plane and head back to Minneapolis. It was just about the easiest traveling I could do. Mark: We've been talking about your time in Memphis, lets move on to your home territory, the AWA. Verne Gagne's AWA had been successful for many years. What do you credit with it’s success from the 1960s through the 1980s. Nick: I would say basically the AWA thrived because of the nature of the talent, especially in the early years of the AWA. You had Verne Gagne and Wally Karbo who were the brains behind it in the beginning. Verne had been an amateur wrestler, an Olympian and then a professional wrestler. Gagne had set such a high bar on what he expected from himself, that he also expected it from his wrestlers. When you have such a high set of standards, it is almost magnetic in how it attracts very talented people. If it’s in music or whatever, when you’ve got very talented people working for you, you’re going to produce some very nice product. The other thing about the AWA was that ironically it was really was a very big territory. I wrestled in Texas, Memphis, Denver, Minnesota, Chicago, California, Nebraska and many more. I carried my end and was very professional in each city. Each of the cities had great representatives to face. If the fans like it, they would by the tickets and that made us successful. Mark: Here's a Vince question. Did Vince McMahon destroy kayfabe or was the change inevitable, with the advent of cable TV. Finally, was he the scapegoat. That was the nature of the business then. A lot of the individuals who promoted consolidated and maintained the difference. Kansas City was it’s own territory at one time, Omaha was its own little territory at one time, Chicago back in 1956, I worked there in the summer and it was its own territory. Then all of a sudden they partnered up and started to run together. Back in the day, if any of those promoters thought they could sneak in the towns of the territory right next to them, put their TV in, and start running against there competitor and take that territory, they would have done it. Sam Muchnik, president of the NWA back then didn’t like that. He tried to appease everyone. New York City was the heart of the country’s television mentality and Vince was in the middle of it. The main difference between Verne Gagne and Vince McMahon was that Verne was reactive and Vince was proactive. In the early 1980s, before Vince made his push, the AWA was seen nationwide on ESPN. This show came about because ESPN came to Verne and asked him to do it. When Vince decided to do it, he made it well known to everyone in the business that in theory, if he could improve and expand the business with nationwide TV, he was going to do it. Well with this plan, he wasn’t going to bring all the other promoters in as partners so they of course hated it. When you stop and think about it, all the different small territories needed to be consolidated when the national TV came. Vince just moved first and quicker. Plus, most of the other promoters, and this is the God’s honest truth, would roll into their office around 10am. Check to see what towns were on for that night, check to see who was handling the shows in that territory, handle all matchmaking for the show, etc. By noon to 1pm, they would finish up and the guys would pack up and go fishing, or ride motorcycles or whatever wet their whistle. They enjoyed life. Vince just eats, sleeps and loves the business. It was inevitable and the TV was available to the McMahon's. Mark: Can you tell me about Bobby Heenan? Nick: Bobby was the best, 100% the best. I was fortunate to have 2 people I became associated with in the AWA; Ray Stevens, who was considered one of the finest talents in the profession and Bobby Heenan, the best mouth in the business. Not only that, if I was asked “who was the best worker of all time”, I’d say it was Bobby Heenan. Why would I say that? When Bobby would get into the ring, his intent was to stir that crowd, to entertain them, to let them see what they came to see. No one could do it any better than Bobby Heenan. He was that good. He could walk across the ring and get more trash thrown at him without doing anything other than looking at the people. He could take the wresting bumps, wrestling moves, over the top rope, thru the ropes… I can’t complement him enough. In the ring, Bobby was quick and could react to anything. Back when Ray Stevens and I were tag teaming, one of us might miss the card and they would replace the missing one with Bobby. When the announcer would notify the fans that either Ray or I wasn’t there, and would be replaced wit Bobby Heenan, the building would explode with cheers. The fans were convinced that Heenan would get it tonight for sure. He was that good. You would get into a car with Bobby Heenan for a 200 mile road trip. Around a 4 hour drive. You would laugh for the first 2 hours and just be hysterical. Not that Bobby was trying to be funny, it’s just that as he would talk about things, the wrestlers, the arenas, the refs, the hanger-ons the girl wrestlers… Just the commentary he would make would run you up the wall. Bobby’s wit was unbelievable and fast, he was the same way in the ring. Mark: I heard a rumor that you were offered the NWA world title back in the early 1980s. Can you confirm or deny this? Nick: Haha, ok, let’s put it this way. I was the AWA champion. I was going to Memphis, Houston and as well as San Antonio. Fritz VonErich called and got me booked in Fort Worth. This was my first trip there and during it, Fritz implied if I wanted to consider making a permanent move to the NWA he could be very instrumental in seeing that I might be on a fast track in getting the NWA world title. Soon after that, I was in Atlanta and had dinner with Jim Barnett. At the time, Barnett was the official booker for all of the matches of the NWA world champion. He was also the promoter for the Georgia promotion. Back before my AWA years, I had also worked for Jim in Georgia promotion. As we had dinner, I asked “Jim how many nights a week did the NWA world champion work?” Jim responded, “Oh my boy, he works about 6 1.2 nights a week.” He also told me it was year round and what the pay was. I went home and put the numbers together. With the totals in hand, I was working six months out of the year. That included the trips to Memphis, Texas, Florida and Georgia. The NWA champions schedule including TV shots would equal out to 360 days a year and I didn’t want that. That was another great thing about the AWA territory. You averaged about 3 ½ nights a week. There was no way I was really interested in becoming the NWA world champion. Mark: In the mid-1980s, there was more than a few title changes in the AWA. Stan Hansen eventually got the belt from Rick Martel. I also heard a rumor that there were talks of putting the belt on Bruiser Brody. Was Verne trying to compete with WWF (the bigger type guys)? Nick: No, not really. Originally, to make Verne and myself some extra money, I dropped the title to Jumbo Tsuruta. Tsuruta turned around and lost it to Rick Martel. Who as far as I was concerned was the premiere babyface in the business at that time. Why Martel? He had a hell of a body, good looking as hell, a thick head of hair and the woman wet their pants whenever he comes in the room. Plus he had that little bit of a French accent to add it to mix. Top that off with the fact he’s one of the nicest guys you’ll ever meet. I would have loved to have seen him stay champion for a longer time. Why all of a sudden Stan Hansen got his hands on the AWA world title, I don’t know. God love Hansen, he was just a big monster. Heavy handed all the way. It’s a shame him and Brody… They were rebels. It’s like they almost wanted to jerk the business around if they could get away with it. It turned out they were able to go to Japan 6 months out of the year and make some amazing money. So they didn’t need to get along with any of the promoters here stateside. They were just bratty little kids that happened to be 6’6” and weighed 300lbs who would hit a lot harder than kids. It’s sad and funny. When I worked Amarillo I would tell Dory Jr and Terry Funk that it was their dad’s fault for Hansen and Brody being crazy. It was something in the water. They both went to college at West Texas State and ended up breaking into the sport in Dory Funk Sr.’s Amarill promotion. Mark: Ok,one last question about Hansen. I heard destroyed your AWA belt. Nick: Ohhhhh yes! After Stan wound up with the belt, Verne was having a new one made. The belt Hansen had was the one I designed and had made back in the 1970s. During this time, Verne decided it was time for Stan to drop the belt back to me. Stan said no thanks and left the arena and went home. The office sent a letter to Stan stating it was their property and they were about to sue him to get it back. Now that meant that if Stan wanted to try and keep the belt, he’d have to hire an attorney to argue the case. Hansen was very thrifty. He’d get a little smirk on his face if he were to read this, because he wasn’t going to spend a single dollar on keeping that belt. The story goes Stan took the belt out in his yard and then proceeded to run over it with his pickup truck. Afterwards, he put all the pieces of the belt into a fedex box and shipped it back to Verne. One of the reasons I believe it’s a true story is because when we got the belt back, there were muddy tire tracks all over the belt. The belt was also bent in the center. I still have that belt. I took it to a jeweler that I know and he was able to fix it and put the curve back into it. That belt will go to my grandkids one day. Mark: Let’s talk a little about the WWE’s Hall of Fame. It seems like they are trying to honor all aspects of wrestling history, even for those who weren’t in the WWE, WWF or the WWWF. Mark: I didn’t realize Jim Barnett was the one who started that. Nick: Oh yeah it was him. I was in, this goes back to 1959 or 1960, Indianapolis and they ran shows Thanksgiving and Christmas day and did $25,000 houses those day. That was good back in those days. That was Barnett. From there on, everyone else started the same thing. Nick: This year’s reunion is scheduled for April 13, 14 & 15 in Las Vegas at the Gold Coast Hotel & Casino. The great thing about the 3 days is this event brings a lot of the boys together. There are folks from the journalistic end, such as yourself, as well as just the ordinary fans. Everyone is there together. There’s lots of hugs there, lots of respect is given to the boys for everything they went thru. The life of a wrestler was a very tough thing. It was tough on families, the body, traveling, you name it. It’s almost like every few minutes you can get a few guys that will look at one another and if they knew each other back then… like when I wrestled in Hawaii, I knew Nick Kozak. If I were to see Nick today at the reunion, I’d be smiling from ear to ear and have tears in my eyes. That’s what that whole 3 days is like and I feel it’s very special. Its fun to see a bunch of old and new faces, as well as meeting the fans. I’ve meant to go to the Gulf coast wrestling reunion, but because of different issues, I just haven’t been able to. There’s a lot of guy down there whose names I know and even though I might not know them personally, I respect what they did and what they went through. For those of you on the journalistic side, it must be interesting as well. How do you like being the president of the CAC? Nick: It was a unique walk of life to have gone through. Even being a second generation, because I could sit and tell stories from my dad’s generation. My dad was sort of the guy who sort of found Lou Thesz and helped get him into the business; they were both from St. Louis. As a little kid, I was in the locker rooms and saw so many of these people. You might say that my entire life in some capacity or another is in association with the business so I feel very honored to be president the CAC for the past year and a half. Nick: If you can afford it this year, we’d love to see you. The room rates are extremely reasonable this year because of the economy. The plane tickets to Las Vegas are more reasonable this year as well. At the reunion, they also have a vendors area with tons of memorabilia. Items like pictures, books, dvds and a lot more. I believe this year they are having a bowling tournament to go along with the regular cribbage tournament they throw. All of this in addition to the awards banquet and everything else. Mark: I really appreciate you taking time out of your day to allow me to interview you. Nick: It was my pleasure Mark. I hope to meet you and all your readers at the reunion this April (2009).